Can You Get Memorial Glass Jewellery Engraved? Are you wondering if you can get your memorial glass jewellery engraved? Cremation glass jewellery is such a personal, unique thing, and often the most precious piece of jewellery you’ll ever own. So, it makes sense that you’d want to engrave it with a special message to remember a loved one. It can also make a great, sentimental gift for a partner or family member. The good news is that you can get some memorial glass jewellery engraved, but it will depend on a couple of factors. Having worked in glass design for over 20 years now, I’m going to tell you what you need to know about cremation glass jewellery engraving. How can you get cremation glass jewellery engraved? Some cremation glass jewellery companies do offer engraving as part of their service. However, it can be quite specialised, and some may outsource it to other companies. This could affect the overall delivery time of your jewellery, which is usually 6 – 8 weeks to begin with in regards to larger online companies (smaller businesses may have a shorter turnaround time). 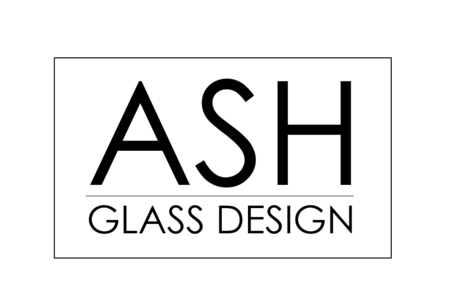 At Ash Glass Design we take around 2-3 weeks from receiving order to completion. If a company does offer an engraving service, this is usually something you would request upon making your order, or when sending your order pack and ashes to the company in question. For companies that do engraving in-house, you may wish to check how they engrave their jewellery. Some may offer a hand-engraving service, whereas others may have a machine to help with accuracy. For instance, I’ve recently invested in a state-of-the-art engraving machine which uses a traditional diamond-drag technique. 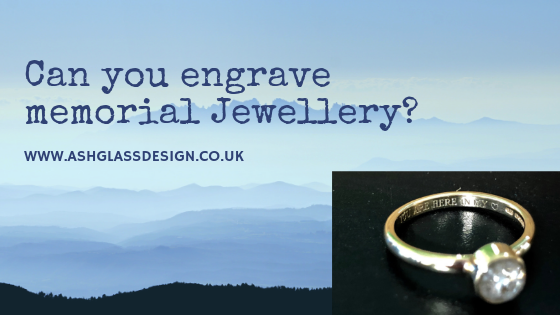 Which pieces of cremation jewellery can be engraved? It’s also worth noting that not all cremation jewellery pieces can be engraved – for instance, can you imagine the task of engraving on the back of an earring? It’d be extremely tricky! As a rule of thumb, the smaller the jewellery, the trickier it is to engrave. My favourite engravings to do are usually the ones that contain messages that are a bit quirky. I find an inscription of a common saying or in-joke tends to be so much more personal than a standard ‘RIP’. Your memorial glass jewellery should ideally be hallmarked and made from good quality materials. The font of the engraving should be clear and easy to read, and should ideally be either engraved with a quality gravel-graph engraving machine, or engraved carefully by hand. Finally, if you’re unsure of what to get engraved on your piece of memorial jewellery, my advice is to wait until you know exactly what you want. You can always take your jewellery to an engraver or local jeweller later on, because once your message is on, it’s final. Thanks for reading. By now, you should have a better idea of what to look for when getting your memorial glass jewellery engraved. It’s quite a specialist services, but some memorial glass jewellery companies will offer this. Just be sure the quality of the materials and the engraving is up-to-scratch! Do you have any questions about cremation glass jewellery engraving? If so, please just call me on 01896 850447 or email me kenny@ashglassdesign.co.uk – I’m always happy to answer. How Does it Feel to Hold Cremation Jewellery for the First Time? What’s the Most Comforting Thing About Owning Cremation Glass Jewellery?